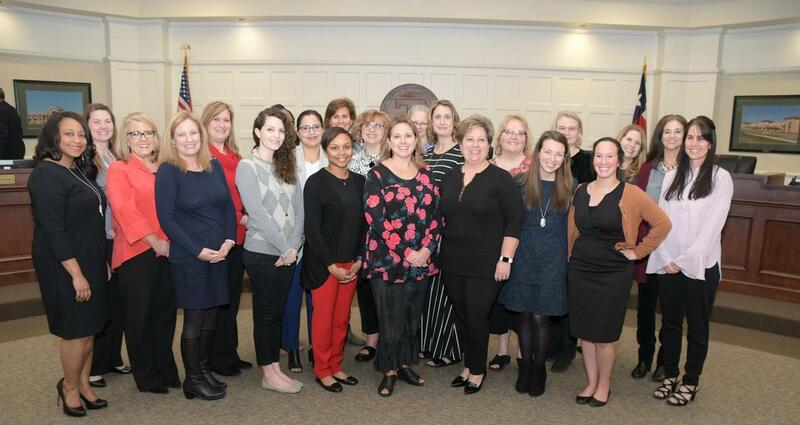 As part of the National School Counseling Week 2019, sponsored by ASCA, Tomball ISD recognized counselors from across the district who go above and beyond for students on their respective campuses. National School Counseling Week 2019, "School Counselors: Providing Lessons for Life," was celebrated from Feb. 4-8, 2019, to focus public attention on the unique contribution of school counselors within U.S. school systems. National School Counseling Week highlighted the tremendous impact school counselors can have in helping students each and every day. 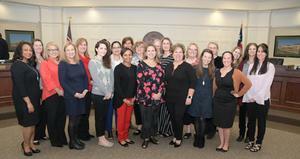 The group of counselors were honored at the February Board of Trustees workshop meeting. Professional school counselors are certified, experienced educators with a master's degree in guidance and counseling. The combination of their training and experience makes them an integral part of the total educational program. "School counselors work with all students to remove barriers to learning by addressing students’ academic concerns, career awareness in post-secondary options and social/emotional skills,” said Kwok-Sze Wong, Ed.D., ASCA executive director. Counselors not only assist students in educational endeavors but now, more than ever, provide social and emotional support for students. They provide a positive environment that enhances the students’ ability to properly manage the social and emotional demands of their lives. “Our role has changed and is now focused on taking care of the whole child and not just the academic portion of their school life. We really look at all aspects of their life and help them cope and develop in every way possible,” Lead District counselor Jennifer McCready said. “I think it has moved far beyond the paperwork aspect of just making sure they have all their classes they need to graduate. We really are talking to them about what their goals and are helping them to become productive members of society,” Kathy Hannan, Canyon Pointe Elementary counselor said. Tomball ISD houses a Comprehensive School Counseling Program that ultimately contributes to the overall safety and security of a campus. “Comprehensive school counseling programs help to increase student achievement and provide a much-needed resource for students, parents, teachers and administrators. School counselors are integral to student success,” Wong said. School counselors also provide students an avenue to explore talents and traits that may later relate to career development for their future. They continually help promote ways for parents to support their children through social, personal and educational growth and work with teachers to help guide students towards realistic goals. “What I enjoy most is working with the students and their families and seeing them grow, change and flourish,” Erin Thaemlitz, Creekside Park Junior High counselor said. Not only do counselors provide support for students but for staff as well. “We also always want our staff and teachers to know we are here to support them as well. It is important that our teachers know the things we do can’t be done in isolation or alone. We work hard to collaborate with teachers on the social and emotional side of every child,” Hannan said. In Tomball ISD, the role of a school counselor has grown and changed, but in the end, supporting children and staff remain constant. “Of all the professional counselors I’ve worked with in my career, the ones we have here in Tomball ISD are top-notch. We are committed to making sure our students are okay, to helping them grow and to help them succeed and achieve their goals,” McCready said. “Being a new counselor to Tomball ISD this year, I’ve been impressed with the camaraderie that we have as counselors and the support we have as our roles have changed,” Thaemlitz said. For their continued growth and willingness to adapt to changes, school counselors have been honored for their efforts. “Tomball ISD advocates for us as counselors and that is very important to have when we strive to make a difference in children’s lives,” Jenny Fontenot, Willow Creek Elementary counselor said.